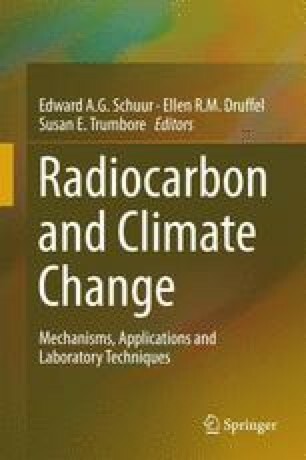 This chapter begins by summarizing some of the recent changes in the global carbon (C) cycle, contrasting patterns that exist today with those of the past several hundred years. With this backdrop, the chapter then examines the overall distribution of C isotopes as a framework for understanding the global C cycle and the changes that are happening to it. These important themes are followed in more detail throughout other chapters of this book, giving insight into C cycling from small to large scales and through all of the important Earth reservoirs. Ciais, P., T. Gasser, J.D. Paris, K. Caldeira, M.R. Raupach, J.G. Canadell, A. Patwardhan, P. Friedlingstein, S.L. Piao, and V. Gitz. 2013. Nature climatic change. Published online: 14 July 2013; doi: 10.1038/nclimate1942. IPCC. 2013. Climate change 2013: The physical science basis. In: Stocker, T.F., D. Qin, G.-K. Plattner, M. Tignor, S.K. Allen, J. Boschung, A. Nauels, Y. Xia, V. Bex and P.M. Midgley (eds.) Contribution of working group I to the fifth assessment report of the intergovernmental panel on climate change. Cambridge: Cambridge University Press, 1535 pp, doi: 10.1017/CBO9781107415324.